Late last week Consumerist ran a report about a stolen iPhone that was being sent back to Apple for repair. The report comes from the owner of the phone who laments the lack of assistance from Apple. Also, if there's anything to learn from this it might be that you should follow through with filing a police report if you're ever robbed, as that might give you the leverage you need to get a company to help you. Possibly not with Apple, though. The Cotton Bowl, the New York Philharmonic's New Year's eve concert and the NFL's Giants playing the Vikings may not seem to be related. However in the strange world of DirecTV they share a common element. Now what could these events possibly have in common? Well if you want to see them in high definition (HD) and you're a DirecTV subscriber in Boise you'll need to shell out for another television antenna. 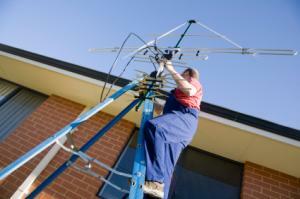 In fact if you want any of the many HD offerings from PBS, NBC, ABC or FOX you'll need another antenna. A short time ago Twitter went offline following reports that the site had been hacked by a group posting under the name Iranian Cyber Army. If you're quick you can head over to Google and get a cached copy of the page minus the graphics. This screenshot came from Google's cache a short time ago. If you're in town for the National Finals Rodeo or just want to do some shopping Cowboy Christmas is one of the best times you can have in Las Vegas. And contrary to what the ads say this part of what happens in Vegas doesn't stay in Vegas. The Las Vegas Convention Center hosts the Cowboy Christmas Gift Show which is open 10AM - 5PM daily from Thursday, December 3 through Saturday, December 12 at the Las Vegas Convention Center this show bills itself as "longest running and only “Original” gift show of the Wrangler National Finals Rodeo." The convention center is easy to get to on the Monorail as well making it hassle-free to get to. My personal favorite the Ariat Country Christmas Western Gift Expo returns for the 16th year at the Sands Convention Center and runs from Friday, December 3 - Sunday, December 13. Their site doesn't give hours but it's safe to assume they will be similar daytime hours. The Ariat Country Christmas is the only of the three to be open on Sunday Dec 13. This is definitely in the better late than never category. Back in January I did a presentation on Drupal multi-stite at the San Diego Drupal Camp and near as I can tell I never quite got around to posting the slides. In fact I even modified the presentation a bit and gave a similar talk at the May Boise Drupal User's Group meeting. So here's that presentation for your viewing pleasure. Download the PDF version of the slides here. Last weekend the fantastic folks at the Seattle Drupal User's Group (SEADUG) put on a fantastic Pacific Northwest Drupal Summit at the Adobe campus in Seattle. I hope to get some time to post some reflections on the many great sessions. In the meantime here are the slides from a talk Jakob Perry and I gave on connecting your site to social media. When I tweeted a few days ago about the giant ball of fail that resulted from trying to order DSL service from Qwest I told the representative I'd blog about it because it wouldn't fit in 140 characters. Again closer but still not right as the zip-code is wrong.